Since the audience gets to see Jenny throughout her life, we also get to see her various styles as well. From sweet teenage girl to a hippie girl, and to full grown woman. As for a hippie look, Jenny wears a loose cotton dress topped with long brown vest, a brown belt, brown suede boots, and many accessories. 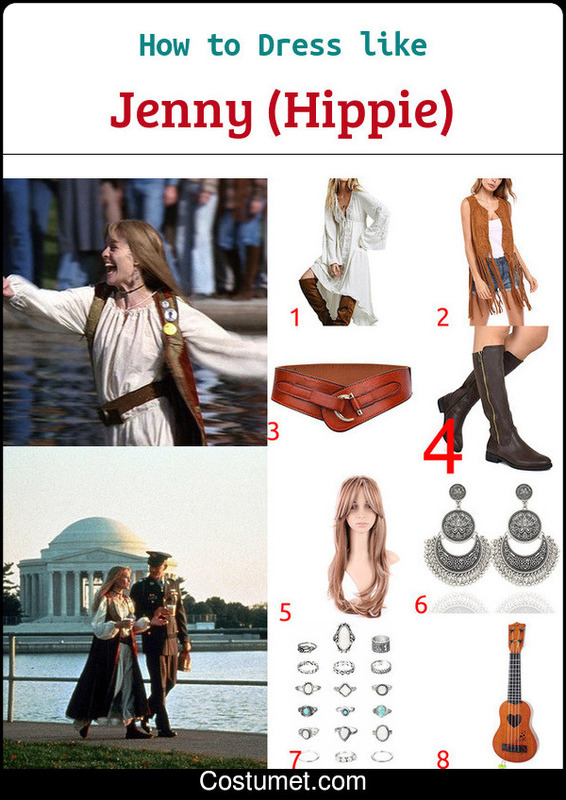 If you want to create Jenny's hippie look, checkout our items down below! 1 White Cotton Dress Look for a plain white cotton embroidered dress to wear. 2 Long Brown Suede Vest Top your dress with a brown suede vest. 3 Brown Leather Obi Belt Fasten a brown obi belt over your dress. 4 Brown Suede Boots Match your outfit with brown boots. 5 Blond Wig with Bangs Recreate Jenny's hair using a medium length blond wig with bangs. 6 Boho Earrings Get a boho styled earrings to wear. 7 Boho Rings Also, look for rings with boho style. 8 Guitar Prop Jenny is seen being around guitar in this period of her life, give yourself one to carry. In 1994, a feel-good comedy-drama movie "Forrest Gump" was released. It starred Tom Hanks as Forrest Gump and Robin Wright as Jenny. While the main story revolves around Forrest, a slow-witted but kind-hearted and lucky man from Alabama, the subplot often shades some light on Jenny, a sweet girl with a bad upbringing. Throughout her life, Jenny has been struggling to find herself and fighting a demon within her. With that said, the movie is not only about the hopeful and optimistic Forrest, but it also portrays the real life struggle of a person who had been in traumatic experience through the character of Jenny. Annie wears a frayed pink dress covered with a worn green apron, a red knitted jacket on top, green socks, and a pair of brown boots.